Ophthalmology Physicians & Surgeons, PC is a leading provider of optometric services in the greater Philadelphia area since 2003. The goal of our Optometrists’, including Dr. Barouh, is to help you achieve and maintain clear vision for years to come. At Ophthalmology Physicians & Surgeons, we provide full service eye surgery and offer complete vision care. Patients throughout the Philadelphia, PA area come to us because they know they will receive the personal attention and professional care that is our foundation. Dr. Lindsey Barouh is no exception. Dr. Barouh offers comprehensive vision examinations and eye services at most of our convenient offices located in the greater Philadelphia area. 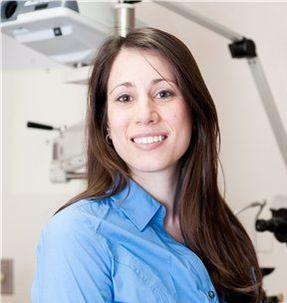 She specializes in routine eye care and the diagnosis, management and treatment of a wide array of eye diseases. At all of our offices, Ophthalmology Physicians & Surgeons provides state-of-the-art diagnostic technology and vision correction products. The latest high-tech instruments are used to screen for vision function and overall eye health. Dr. Lindsey Barouh received her Bachelor of Science degree in biology from The Pennsylvania State University. She earned her Doctor of Optometry degree from the Pennsylvania College of Optometry at Salus University. Dr. Barouh graduated with highest academic honors and achieved clinical honors throughout her externship rotations in primary care, contact lens and ocular disease. Dr. Barouh has been part of our practice since 2011. You can trust your eye care to Dr. Lindsey Barouh …Give us a call. When you visit one of our Philadelphia, PA area offices, you can be ensured that your eye health is our top priority. Our entire team is dedicated to providing you with the personalized care you deserve using only the latest, most innovative techniques in eye care. We are committed to improving the quality of life of our patients in the Philadelphia community through enhanced vision. Give yourself the gift of clear vision – schedule an appointment with Dr. Lindsey Barouh today.